2011: What Have You Learned, Beverly? I know you may find this difficult to believe, but I am not always the smartest person in the world. Today I did something dumb and then did something smart which fixed something dumb from years ago. I read the book about 7 years ago and really don't remember it all that well (especially since there have been 5 books since then), so I decided to re-read the part of the book that concerned that particular episode so I could figure out what the complaints were about. But...it's Outlander. It's Diana Gabaldon and you don't just read a short section of a Diana Gabaldon book. After I read the section that the TV episode covered, I thought I'd read a little further to see what is coming up. And there went the rest of two days. So that was the dumb thing. The smart thing concerns our kitchen. When we moved in here in 1973, I had lots of spices and Walt hung two spice racks. All nice and neat. 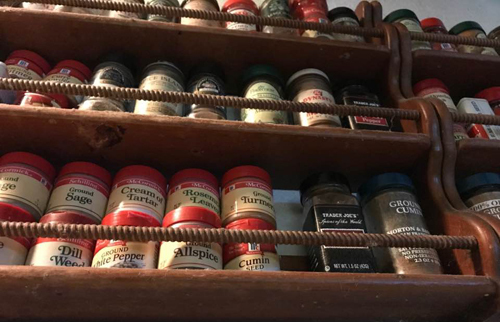 I remember years ago...it might even have been when we were still living in Oakland...when my mother was aghast to discover that I had not alphabetized my spices, something which had, frankly, never occurred to me. But I discovered that once I put them all in alphabetical order, the particular spice I was looking for was so much easier to find. But the problem is that it is 40 years later and my body is shrinking and I can no longer reach the top shelf with ease. 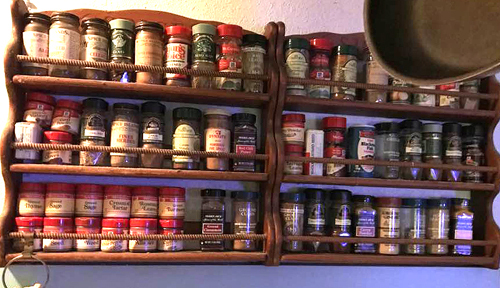 I now have to either stretch and stretch and hope I can flip the bottle out, stand on a stool, or use some sort of tongs to get the spices on the top shelf. But what are the spices I use most often? 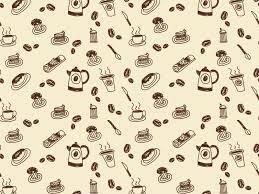 Cinnamon, cumin, chili, curry. All start with C and all are on the top shelf. Today it suddenly hit me that I don't have to have my spices in alphabetical order. There are no spice police to make sure I'm following some sort of rule and even if my mother comes to visit, she would not notice. I could actually put the spices I don't use very often (like Turmeric) on the top shelf and move the most used spices to the bottom shelf. I can hardly wait to cook something tomorrow and reach for a now readily available spice! I've also been watching with interest as the news continues to pour out over the Mueller indictments. I'm wondering how, despite protestations from scowling Sarah, the Teflon Don is going to wiggle his way out of this investigation. Or will he just throw all of his minions under the bus...? Last year it was Star Wars, which I could appreciate. 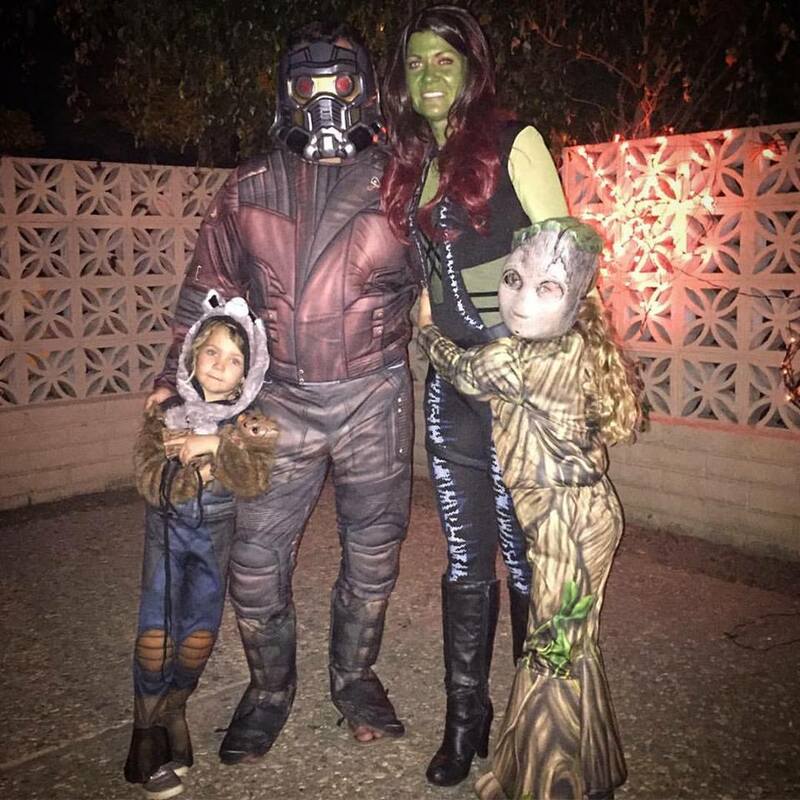 This year it's Guardians of the Galaxy, which I don't know at all.